When I was in LitFest, I helped out with the Claire Ptak demo, her of The Violet Cakes Fame. She bakes will real fiinesse. 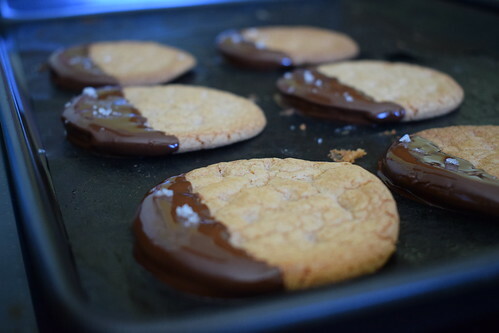 One of the recipes I had to cook of hers was for a chocolate covered digestive biscuit made from dark rye flour. I decided to make these for guests as a treat with a cuppa, and gluten free was the order of the day. As I mentioned the original recipe uses rye flour, and I simply swapped this for buckwheat flour. Buckwheat isn’t actually wheat based at all. It is not commonly used in Ireland, but very common on the continent. With baking, the gluten is the key to light and fluffy textured end product, but you don’t essentially want that texture in a biscuit. So we were already on a winner. It’s high in fibre, and as it is not very processed also retains it’s mineral and vitamin content. It’s not a grass but related to sorrel and rhubarb! First cultivated in Asia in 6000BC, it does not do well in nitrogen rich soil, which is possibly why it’s cultivation died out. As more and more farmers added fertilizers to their ground. 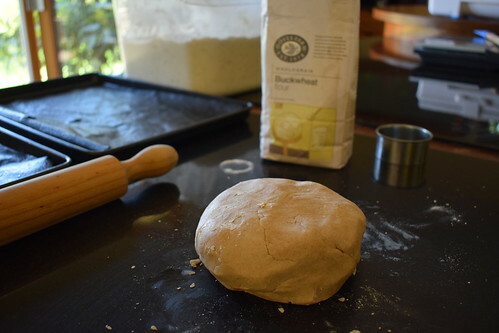 Once the dough is made, it gets rolled straight away, cut into digestive sized biscuits. I used the thin end of a chopstick to get the obligatory holes. Claire had been very specific about this, and it really finishes the biscuits off properly. The next essential stage is to chill the biscuits, for a minimum of 30 minutes in the fridge. And longer if you can. I was under a little bit of time pressure so they puffed up a little while cooking but not enough to affect the flavour! When they’ve cooled on the tray for 10 minutes, remove to a wire rack and melt some chocolate. I dipped the cooled biscuits in this, by tilting the bowl and dipping half the biscuit in. I thought at this stage to put them back on the prepared tin, as I didn’t want the drying chocolate to meld onto the wire rack. A little sea salt on some finished them off nicely. And if you can wait around long enough for the chocolate to dry- be my guest. We couldn’t.